Kulfi is a Indian ice cream. Traditionally made with made with boiled milk, sugar, saffron, pista and cardamom. 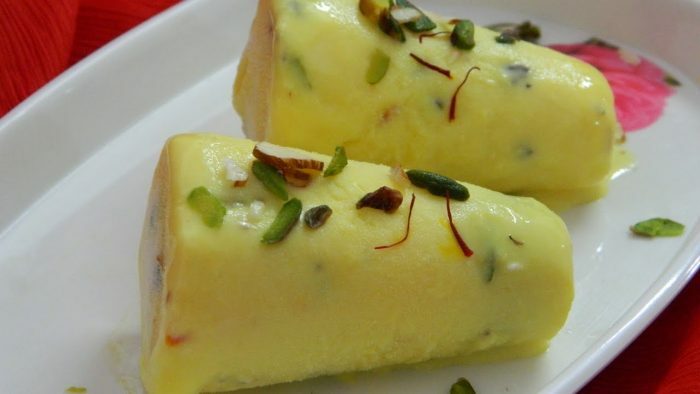 Unlike the regular ice cream, kulfi is denser and thicker on account of it not being churned. Instead, the ingredients are often boiled like a custard before freezing. Because of this, kulfi is sometimes categorised as a frozen custard instead of an ice cream. With less calories and sodium than normal ice cream, the dessert has no artificial coloring or sweetener – making it a more natural substitute. Here is a simpler way – Just use the milk based mithai to make it in a jiffy. Blend the milk rabri with any mawa, almond, pista burfis and freeze in kulfi cones for delicious malaidaar Kulfi shared our friend Meenu Baldwa. Here is the complete recipe for the frozen sweet treat. Heat milk in a thick-bottomed vessel and bring to a boil. Reduce heat and simmer for 10 to 15 minutes. Put Malai Peda, Kalakand, Kaju Katli and Gulab Jamuns in a mixer. Add a little milk and puree. Transfer into a deep bowl. Add the thickened milk and mix. Pour the mixture into Kulfi moulds. Sprinkle saffron strands and almond pieces on each. Screw the lids on the cones and keep them in the freezer to set.